Brent oil prices rose by 1.74% (US$0.98), as prices declined this week. Oil traded on October 19, 2017 at a price of 567.23 (US$/ barrel) and began the year at US$56.90 per barrel. 87 Octane prices increased week over week, by 0.41% (US$0.48 ). Additionally 90 Octane increased by 0.40% or $0.48 week over week. 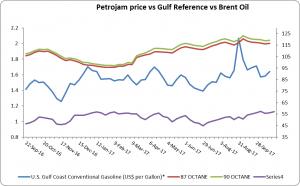 87 Octane and 90 Octane opened the year at J$97.32 and J$98.98 respectively and now trades at J$119.35 and J$116.51per litre. A combination of forecast colder temperatures and higher heating oil prices in the United States is contributing to higher expected household heating oil expenditures during the winter heating season of 2017–18 from October 1 through March 31. According to EIA’s recently released Short-Term Energy Outlook (STEO), the average household that uses heating oil is forecast to spend about $1,460 for heating bills during winter 2017–18, up $210 (17%) from last winter’s average expenditures . However, household heating expenditures are forecast to be almost 15% lower than the previous five-winter average for households using heating oil. Forecast average expenditures provide a broad guide to changes compared with previous winter heating seasons, although fuel expenditures for households are highly dependent on the size and efficiency of individual homes and their heating equipment, thermostat settings, and local weather conditions. Households in the Northeast rely on heating oil more heavily than in any other region of the United States . About 21% of households in the Northeast use oil for space heating, which is down from 25% of households five years ago. An increasing number of homes has switched to using natural gas and electricity for space heating. Nationwide, 5% of households use heating oil.